One of my all-time favorite places in the whole world is Louisiana! I have been there two times and hope to make it back there sometime this year. I love the people, the food and the at home feeling I get when I go there. 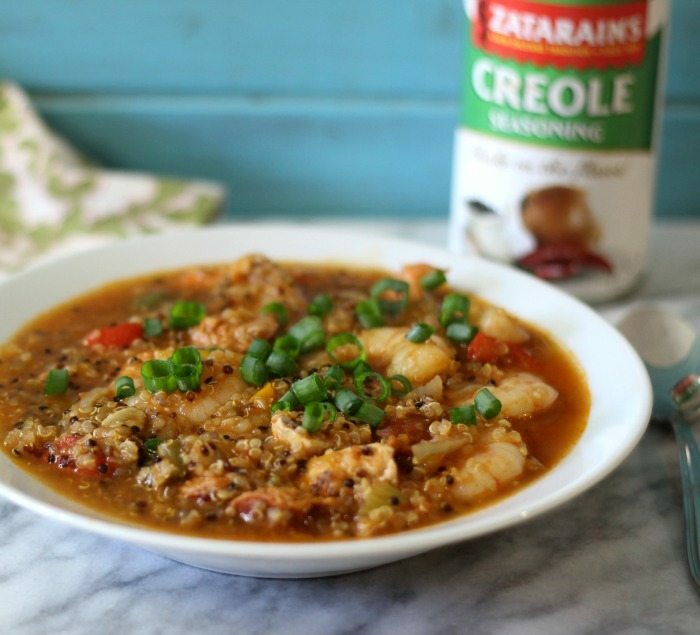 I was so excited when #SundaySupper teamed up with Zatarain’s to celebrate Mardi Gras and Jambalaya. Jambalaya is one of my favorite dishes ever! It’s a wonderful dish that is influenced by Spanish rule of the area during the mid- to late-1700s. French, Italian and even African flavor influences are also present in the iconic dish. It’s mainly made up of vegetables, chicken, shrimp, sausage and rice. I changed my recipe a little bit and made Chicken and Shrimp Quinoa Jambalaya. I am so giddy from this recipe. You really have no idea how much I love Jambalaya! My dish is made with sweet & green bell peppers, onion, garlic, celery, chicken, Andouille Smoked Chicken Sausage, and shrimp. 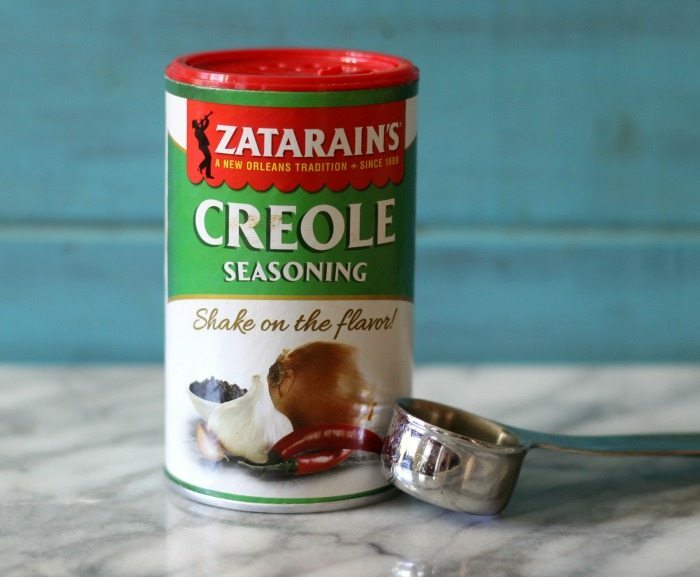 It only needs one seasoning, Zatarain’s Creole Seasoning. My only added touch was a bay leaf. Oh and how can I forget the quinoa? I decided to skip the rice and add one of my favorite grains instead. 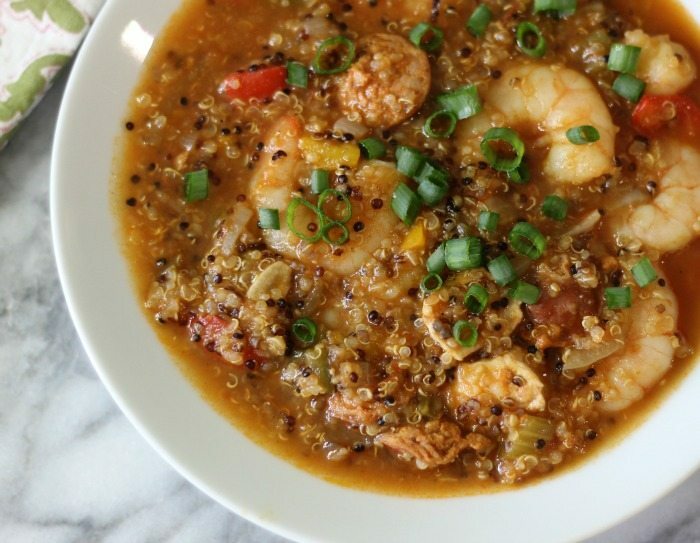 Anyone who is not a fan of quinoa will change their mind if they have it in Jambalaya. The recipe in general is so easy to make! I just sauté my vegetables, scoop them out of my pot and cook my chicken and sausage. Then I add the vegetables back to the pot and add chicken broth, tomatoes, Zatarain’s Creole Seasoning and quinoa. Let it cook for about 30 minutes and then add the shrimp. So perfect! I must have tasted tested about a serving. I couldn’t stay away. This recipe makes a lot! I figured about 10 cups. I ate about 2 cups for dinner and I was beyond full. My belly was going to explode, but I couldn’t stay away. This makes for a great recipe for a crowd! You can also freeze it too. Not only is this recipe the perfect Mardi Gras recipe, but is perfect to have on a cold winter’s night. It really warms your belly. I tend to get excited and forget to tell you details. Sorry about that! I wanted you to know that if you let the Jambalaya rest for a little bit before serving, it really thickens up. The only thing missing from my recipe is bread! You need some good French or sour dough bread to pick up any juices you have. The flavor is slightly spicy, but has the most amazing Southern flavor. As you can tell I love it!! Doesn’t the pot look like good old fashion home cooking? It looks like it would be made at the best Southern Louisiana diners. You know how I love my diner food! 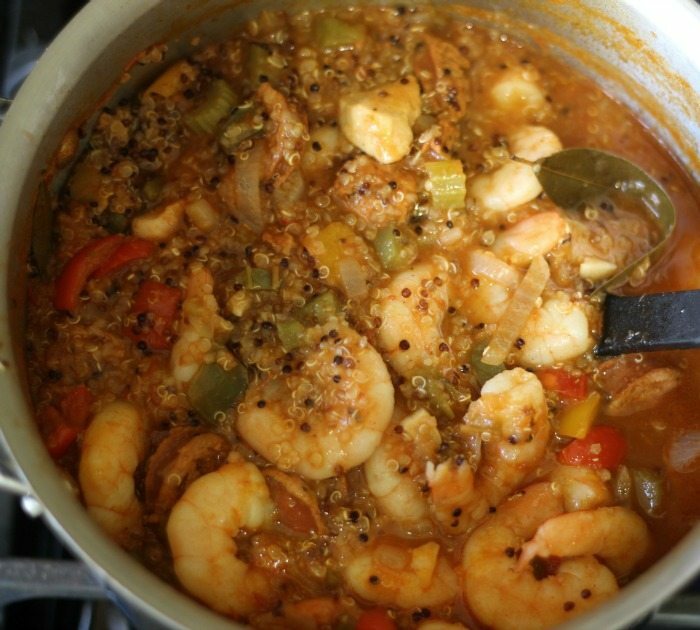 A slightly spicy Cajun dish of Louisiana full of vegetables, chicken, shrimp and sausage. In a large stock pot; add 2 tablespoons olive oil and all of the vegetables. Over medium heat cook the vegetables until slightly tender; about 5 minutes. Take the vegetables out and place in a bowl. In the same stock pot, over medium heat; add 1 tablespoon of olive oil; add chicken and chicken sausage, cook until chicken is cooked; about 6 minutes. Add vegetables back to the stock pot; give a good stir. Add crushed tomatoes, chicken broth and quinoa. Mix well. Stir in Zatarain's Creole Seasoning and bay leaf. Cover pot and let simmer for about 30 minutes; until quinoa is light and fluffy. Add the shrimp and cook until no longer pink. Give a taste test and add a few splashes of hot sauce if desired. Serve with diced scallions over the top. I wanted you to know that this year Zatarain’s has been in business for 125 years! Wow! 125 years, it just goes to show that you are getting good tasting food and spices. You should check out the Zatarain’s website for more information on the company: Zatarain’s Website. 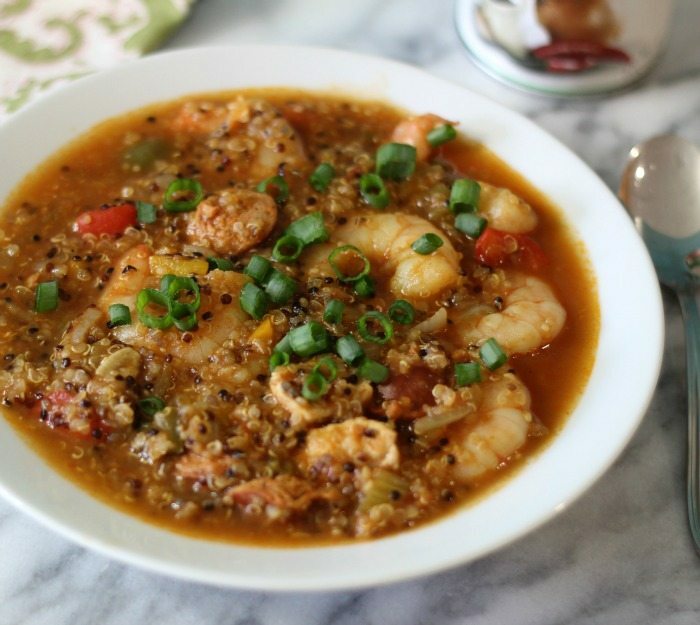 Jambalaya is great for parties and particularly Mardi Gras celebrations. Here is the star of today’s recipe. 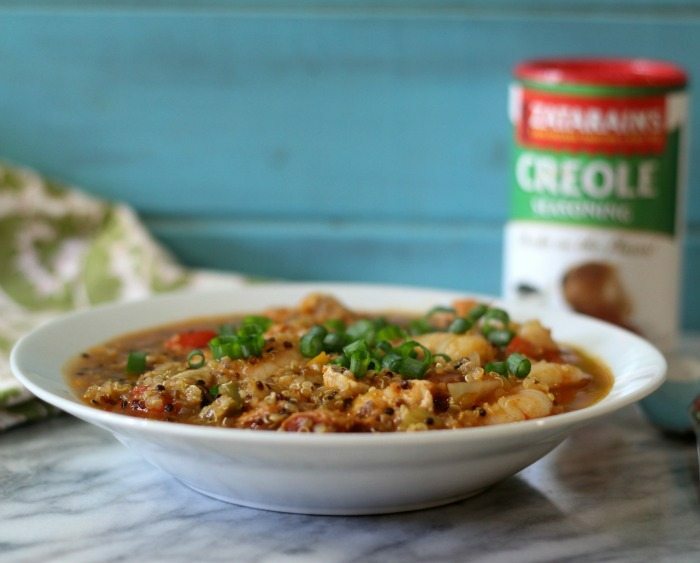 To check out more fun recipes using Zatarain’s Creole Seasoning and Zatarain’s Jambalaya Mixes you should check out the Pinterest Board. You will see some great recipes and gorgeous photos. Be sure to check out the other #SundaySupper Jambalaya recipes. There are some pretty creative ones. What a brilliant recipe! 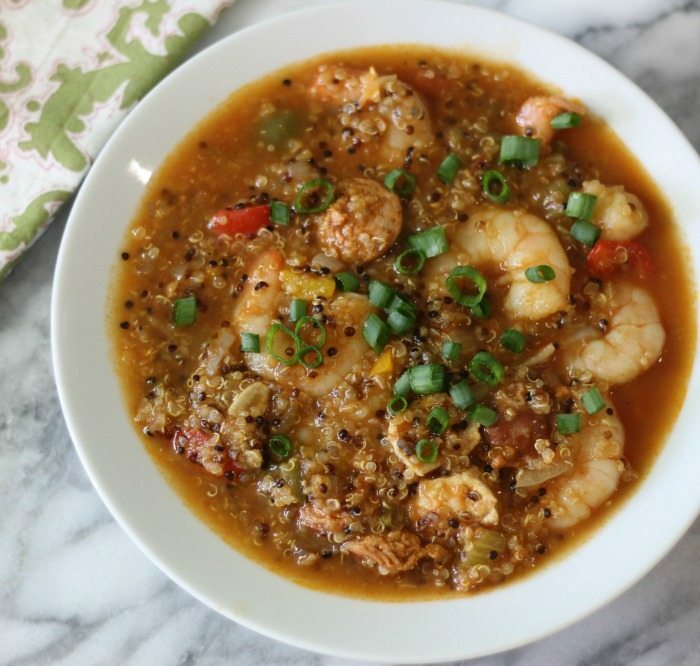 My next jambalaya will be with quinoa!! Yours looks fabulous! Thank you Liz! We just love it with the quinoa. 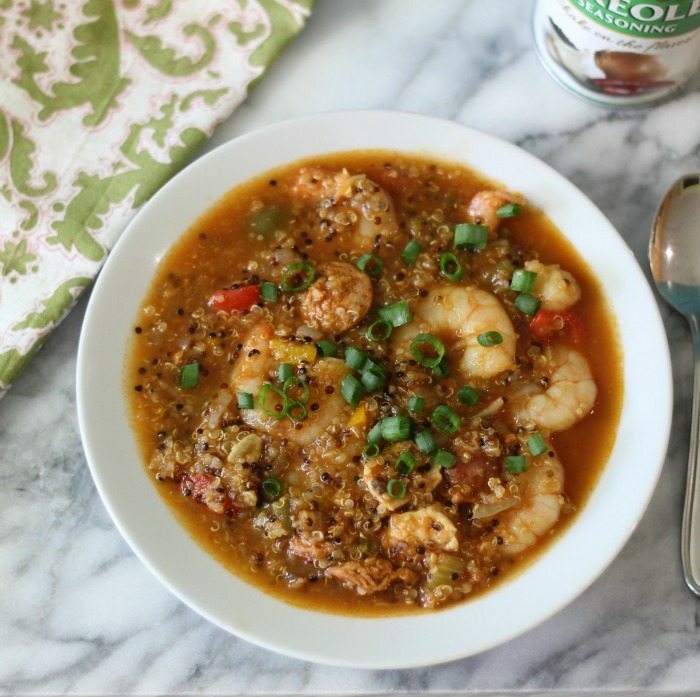 What a great recipe, love the addition of the quinoa! Love your recipe and love you used quinoa too! Looks delicious. This looks really delicious and I love the swap for rice to quinoa. Totally delicious! And I love the quinoa in there, soaking up all the delicious flavors. I’m definitely making this soon! Thank you! The quinoa makes an nice addition instead of using rice. I hope you enjoy it! I can’t wait to try this! I love the use of quinoa!